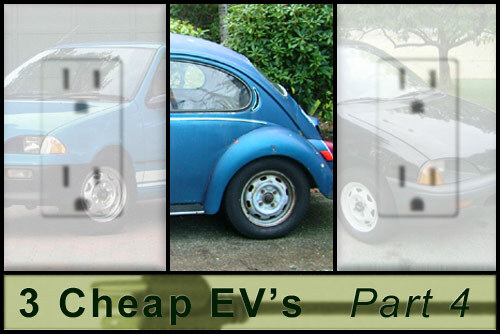 Electric cars don’t have to be prohibitively expensive.Â In fact, they can be surprisingly affordable for a resourceful tinkerer.Â In Part 4 of this 5 part series, Paul Holmes answers ten questions posed to him about his $2200, 1971 Volkswagen Beetle electric conversion, and the lessons learned from the experience. The total cost was $2200. The batteries were $1500, and everything else was about $700. I could have gotten a good deal on some used Deep Cycle batteries, but my wife applied for a Sears Card, so we got six Platinum Die Hard Deep Cycle AGM batteries. I estimate that it will go 20 miles at 25 mph (totally dead battery pack). The maximum I have driven it was about 12 miles in a day, and it still had plenty left. 3) How fast can it go? The top speed is about 50 mph. The fastest I’ve gone is 45 mph. The front of the car shakes if I go over 35 mph (the Super Beetle Shimmies – still working out some bugs). I typically cruise at 30 mph. No one gets angry at me, and it keeps the current draw from the battery pack down to about 70 amps. 4) Why did you do this? My wife and I rented the movie “Who Killed the Electric Car” a while back. Around the same time, I watched “An Inconvenient Truth”. I converted my bike to electric and began using it as my commuting vehicle to various substitute teaching jobs. As I would sit in traffic behind cars, it would make me choke sometimes. I started to see all those cars as stink bomb factories. They were everywhere, everyday. I noticed that it smelled really nice for about an hour after it would rain, and then the stink would slowly take over once again. I imagined what it would be like if all the cars were electric. Sitting at lights in total silence. No stink being emitted. It could smell beautiful and fresh every day, assuming we could generate the electricity in a clean way. Well, I wanted to be the change that I wanted to see in the world. I decided to attempt a cheap conversion, even though I had no idea how. I knew a cheap conversion could be done after reading Dr. Larry Tillman’s conversion blog (part one, part 2, EV Album). Then I saw some videos of the ForkenSwift. $680? Heck! I could afford that! Also, after riding an electric bike around for a while, I just had to drive in an electric car. Also, gas was $4.00/gallon. I use it to drive to school every day, each time I get groceries, every time I go somewhere that is not freeway driving. 7) What’s the coolest response you’ve had to the car? I incorporated it into a math lesson for algebra students. We went outside to the parking lot and when I turned the car on, they thought it was very funny that it made no sound other than a click of the contactor. Only when I started to back up did they really believe me that it was on. They started taking out their cell phones and snapping pictures. When I pulled back into the parking spot, the crowd of students parted and then enclosed the car in a circle once I was back where I started. Everyone was offering congratulations and asking how they could do it too. 8 ) What is something unexpected you learned/discovered from your project. I didn’t really think it would work once it was done. Except for a few minor things, everything worked exactly as I hoped it would. It was EASIER than I thought it would be. 9) What was the hardest part of the project? The hardest part was connecting the motor to the transmission. Specifically, making the spacers for the adapter plates was very difficult. They had to be exactly the same length, and they needed a hole drilled down their center, which was hard. You don’t need to know anything about cars to convert a car to electric! I knew NOTHING about cars!!! I’m not demonstrating false humility here – I knew NOTHING!!! If you keep it simple, it can be a fairly straightforward and cheap process. Also, get a professional to mate the motor and transmission. It will be like $500, but it’s really, really annoying making those spacers! Pay the dang money. Finally, the car I think we have all been waiting for in this series! haha! Just kidding. This is awesome! Thanks for showing us that average joes can do this. Although I know you are being modest because you are no average joe! 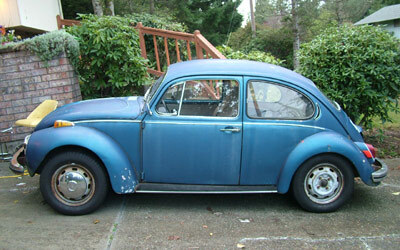 I want to convert my 73 bug to electric but I need it to go 80 miles (at least) per charge. How do i do it? How many 12v batteries can my bug fit in? If I were to buy a used forklift motor, what must the specs be? 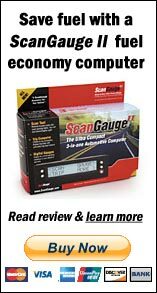 Any particular brand that works best? Also, how big should it be for my 73 bug?